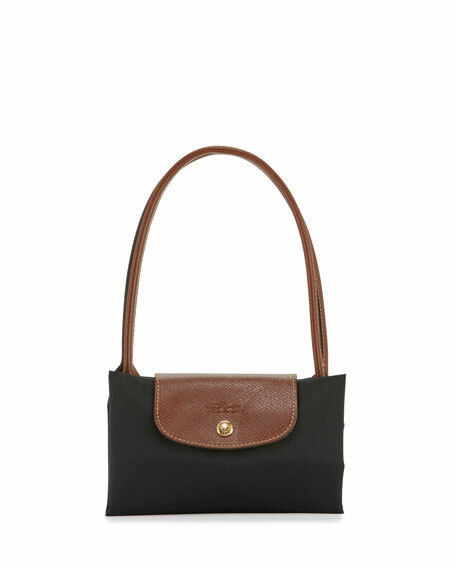 The Longchamp Le Pliage® medium handbag is perfect for travel. Use it to carry extra necessities on a day of wandering, then fold up for easy storage when you get home. 9.8"H x 11"W x 5.5"D; weighs 5 oz. Christian Louboutin leather tote bag with spiked patent sides. Rolled top handles, 4.1" drop. Removable, adjustable shoulder strap, 16.1" drop. Christian Louboutin leather tote bag with spiked patent sides. Rolled top handles, 4.1" drop. Removable, adjustable shoulder strap, 16.1" drop. Open top with tab closure. Interior, one zip pocket. Signature red lining. Metal feet protect bottom. 10.8"H x 12"W x 5.7"D. "Paloma" is made in Italy. 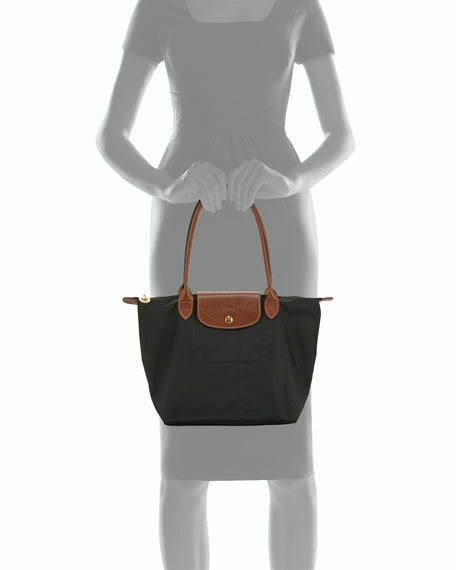 Longchamp "Penelope" tote bag in suede and smooth leather. Rolled top handles with hanging logo tag, 7" drop. Recessed zip top with side-cinch drawstrings. Embossed logo at top center; fringed sides. Interior, nylon lining; one zip and two slip pockets; key clip. 11"H x 13"W x 5"D. Imported. 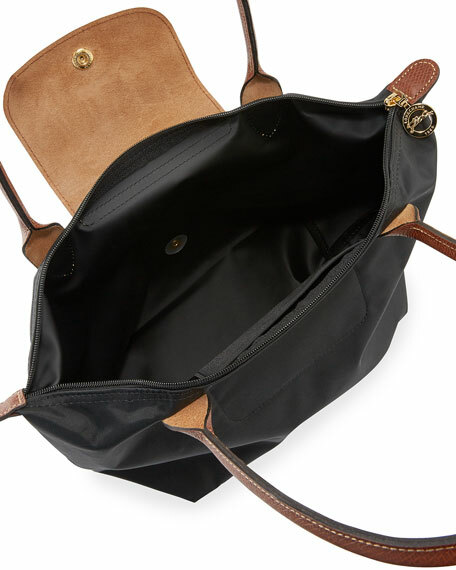 Longchamp pebbled bullhide leather tote bag with black nickel hardware. Flat shoulder straps, 10" drop. Open top with center toggle closure. Exterior, corner snaps expand bag. Interior, one zip pocket, one slip pocket. Leashed key clip. 10"H x 15"W x 4"D. "Roseau Essential" is imported.